Its been a while since PangoScrum beta was released. We have never hoped it would so well received by the community. When we started making PangoScrum, our thought was to use it within our company, since we were tired of using a wiki to manage our Product Backlog, and our Sprints. The first version we made was not very good, the interface was a bit confusing, the modelling was not generic enough. Basically it didn’t supported our needs. We focused this first version of PangoScrum on building a task board, mostly becaused it seemed cool to work with drag and drop in a browser. Eventually we’ve found that it would work. It was confusing, and it fail in giving an overview of how the sprint was going. We realized that we couldn’t replace the real task board. It simply wouldn’t fit a computer screen. You would have to scroll down, or sideways, or maybe use a TV. Then we reached a crucial moment, whether we would continue that path, or rewrite PangoScrum with a new concept. It was easy to decide for the second option. It seemed plausible enough. 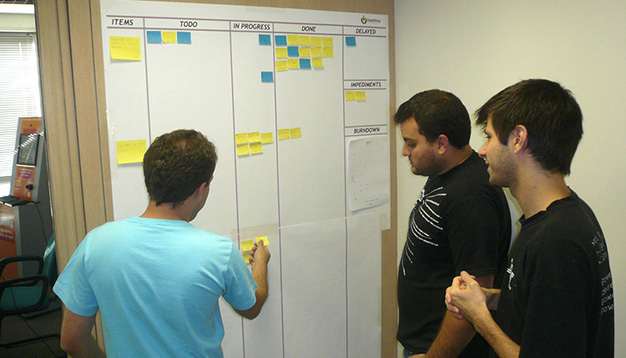 The idea of the second version was to focus on the most important part of Scrum: visibility and under management. By under management we mean letting the team work freely, it simply doesn’t matter whether the team will use hours for tasks estimates, or if they will create a task which will take a full day. The important thing is that the feature gets done. Our choice was not to have a task board at all. In fact, not to have tasks. The overhead of business logic involved in making a task board was simply not worth the value that it adds. By removing this feature we managed to focus on other parts and build a simple and efficient interface for managing Product Backlog and Sprints. We hope to keep improving the interface and your feedback is most welcome. Please feel free to give suggestions. We are already working on some suggestions, and taking care to not bloat PangoScrum with needless features. We hope you like PangoScrum like we do!